LUCKY AT CARDS is a major discovery: This is the book's first publication in 37 years, and first publication ever under Lawrence Block�s real name! 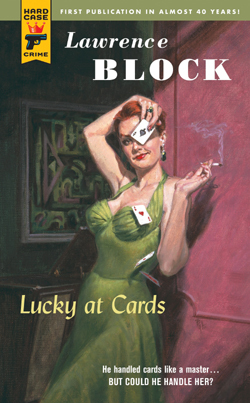 Booklist on LUCKY AT CARDS: "Block unwinds his plot superbly...and, along the way, there is all the teasing sexuality and tongue-in-cheek noir style that a pulp devotee craves...It's a doozy." "The suspense mounts and mounts and mounts...very superior." "Block grabs you...and never lets go." "[The] one writer of mystery and detective fiction who comes close to replacing the irreplaceable John D. MacDonald."